Musician T.J. Howard testifies for the prosecution during Tuesday’s court proceedings in the courtroom of Judge Steve Dozier. To follow along with Saving Country Music’s coverage of the Wayne Mills murder trial, you can follow the numbered updates. After oral arguments were heard by the prosecution and defense in the 2nd Degree Murder Trial for Chris Ferrell in the shooting death of Wayne Mills, the prosecution began to call its first witnesses in the case. 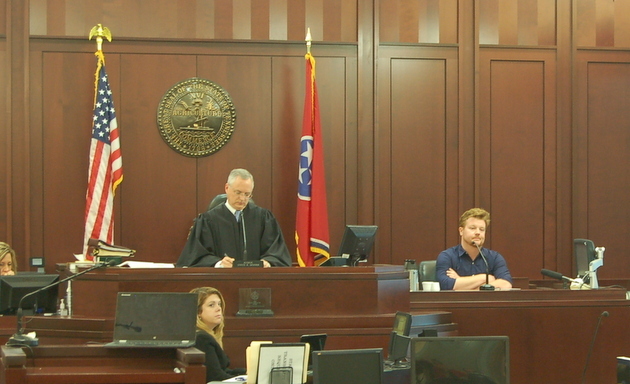 The first individual to take the stand was Nashville artist and Georgia native Eric Lee Beddingfield. Eric knew Wayne Mills for 12 years. “I loved him,” Beddingfield said, and explained how he was part of the Pit and Barrel gathering. He left before the altercation between Wayne Mills and Chris Ferrell began, but was able to corroborate other important facts leading up to the incident. Beddingfield also witnessed that Chris Ferrell had allowed Shooter Jennings to smoke in the bar earlier in the night, and thought it was exceptional because of how strict Chris Ferrell was known to be about smoking. The second witness was musician T.J. Howard, who was at the Pit and Barrel bar with two females, Nadia Marcum and Susan Branham. Howard and the two females comprise the only on-premises witnesses to the shooting, though they were outside when the shooting itself occurred. They did however witness the incidents right before the shooting. 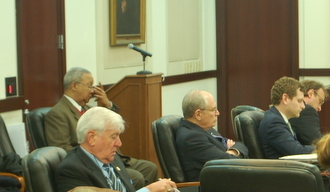 Left to right: private investigator Larry Flair, defense attorney David Raybin, defense counsel Ben Raybin (David’s son), and Chris Ferrell listen to witness testimony. Bailiff in the background. As the situation became heated, T.J. Howard, Nadia Marcum, and Susan Branham left the bar and were approaching their vehicle when the three shots from Chris Ferrell’s .22 rang out, and they witnessed Wayne Mills stumble out of the bar. They left the parking lot, but continued to circle around as Chris Ferrell called Susan Branham on the phone and explained what had happened. This was the four-minute phone conversation referenced by the prosecution in opening statements that occurred before Chris Ferrell called police. Susan Branham advised Chris Ferrell to call 911, and after she hung up the phone, she called 911 herself. At the time, T.J. Howard said he was suffered from a panic attack—a condition he’s diagnosed with and is prescribed medication for. As Howard was describing the specific incidents surrounding the moments right after the shooting, he became visibly distraught on the witness stand. Then many of the police officers and first responders who showed up after the 911 call took the stand. Officer Ashley Arnold, officer Carlos Augulo, and officer Shawn Rosson all testified about what they saw when they arrived at the scene. Officers said when they arrived, Chris Ferrell was outside and “hysterical.” Officers also observed Wayne Mills laying just inside the door of the Pit and Barrel on his back, with his feet facing the door, convulsing like he was having trouble breathing, and unresponsive. There were some towels under him. There was also apparently a large white dog running loose inside the bar. Police did not render aid to Mr. Mills, because their training required them to wait until paramedics arrived. Paramedic William Alex Spencer took the stand and explained how the chain of events transpired after the 911 call was made. Even though the fire station was across the street from the Pit and Barrel, and personnel could have walked there “within 20 to 30 seconds,” because it was called in as a shooting, police were required to arrive first and secure the scene before paramedics could respond. Meanwhile the fire personnel heard the call come in, and a few of the fire personnel were watching out the station’s window. When Mr. Spencer arrived on the scene he observed that Wayne’s pulse was weak and he was breathing erratically. They intubated Wayne and got his breathing back to normal, and gave him drugs to bring his heart rate back to normal as they rushed him to Vanderbilt hospital. 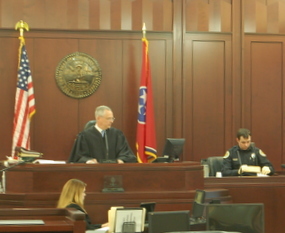 Officer Charles Cole walks the courtroom through the evidence collected from Wayne Mills’ person at Vanderbilt Hospital. Officer Charles Cole was tasked with following the ambulance to Vanderbilt hospital and securing the personal possessions of Wayne Mills. As Wayne was being wheeled into the hospital on a gurney, a .22 shell casing was found on the gurney. Officer Cole secured the casing as evidence. He also secured other personal effects from Wayne, including a VIP pass to the George Jones tribute concert at the Bridgestone Arena earlier that night. Then officer Ken Wolfe of the Crime Scene Investigation unit testified about some of the specifics of the crime scene. Officer Wolfe said he arrived at the scene at around 6:30 a.m, roughly 1 1/2 hours after the shooting. Initially investigators were working the scene under the permission of Chris Ferrell, but as time went on and there was more suspicion Ferrell was going to face charges, they decided to seek a warrant. Meanwhile Ferrell remained on the scene—something Officer Wolfe said he found distracting. With defense attorney David Raybin, the jury was meticulously walked through the crime scene through photos. There were 12 separate pieces of evidence mapped out by crime scene investigators, including the two guns—the .22 Chris Ferrell shot Wayne Mills with and the .45 he initially claimed was wielded by Mills—cigarette remnants, and the broken glass smashed by Wayne Mills. Wednesday morning is expected to proceed with further testimony from prosecution witnesses. They “incubated” Wayne… FYI should be “intubated”. Great reporting and thanks for keeping everyone informed. First, I’d like to thank you Trigger, for covering this trial so completely. I never knew Wayne Mills, but I actually knew the defendant 23 years ago when he lived in Hawaii. My experience knowing him was very unpleasant, and most of the people we knew in common tried to avoid him like the plague. Even back then he had a reputation for unexpected anger outbursts, and being mean and a bully. Hadn’t thought given him a thought for years, until an old friend told me of this. I had read about the accounts of the incident when it first occurred in 2013 and never connected the dots that it was the same guy. Second, since I’ve been researching the trial, I have read several accounts about 2 women who were with TJ Howard outside the bar when the shooting occurred. Is there any information about who these women are, or if they will be called to testify? Also, I’m sure there are many supporters of Wayne Mills that are at the trial supporting his family, but have there been any supporters for Chris? Any family or friends that are visibly supporting him? There are some people in the court in support of Chris Ferrell. There appears to be maybe 8 people who I would assume are family and close friends of Chris, and then a few people in suits who may be advisers to the defense or part of the Larry Flair private investigation firm. On the Wayne Mills side, there’s maybe 40 or so people who appear to be family, and close friends. There’s also a decent a mount of media who have been coming and going who are sitting in the back rows on both sides. News Channels 2 and 5 have employees on site, though they tend to come and go, and the Tennessean also has a reporter here who usually stays until about lunch. Channel 5 has a permanent camera and cameraman in the court room. As for the two ladies, their names have come up in court, but unfortunately I have been unable to confirm the spelling of their names though I have tried. I believe they are considered potential witnesses, but they have not been called yet. If they are called, then their names will be entered to the court reporter. Until then, I also want to respect their privacy to a certain extent, because they may have declined to be a part of the trial. I have confirmed the name of the two women. The first is Nadia Marcum, and the second is Susan Branham. Susan was the woman Chris Ferrell spoke to on the phone before calling 911. Thanks Trigger. I appreciate that. I’ve also read that there was a large white dog that was found out the scene running loose in the bar. Does anyone know if that dog has been identified As Chris Ferrell’s dog. I’ve read that he had a white German Shepard named Yanu that he often took with him around town. I’d be curious how the scene was assessed considering that, as well as an officer mentioning that it was odd that Chris was there during the initial investigation. Also, despite the judge saying “it won’t snow,” has there been any mention of how the weather might effect the trial? The big white dog was brought up by defense attorney David Raybin to almost all the responding officers who took the stand. None of them said they remembered it except for maybe one. No name or breed was given. Something tells me the dog will come into play at some point by the defense. Court will not start tomorrow until 10:30 because of the weather, but apparently the weather is supposed to be so bad, I’m not sure that will make any different. Judge Dozier is know to hold court no matter what once a case starts. He’ll keep people there until 2 AM if he has to. This guy seems like a psycho ala Phil Spector. I hope justice is served. What a tragedy. I know that this is a very heated trial, but everyone needs to let justice take it’s place and time. CF had to wear bullet proof vests and be held in isolation due to death threats There are still death threats against the defendent and his FAMILY. This isn’t the old west and no need for vigilantes.